Just went online and thought I would share the Yahoo TV comments so far. Yahoo, please give us an opt-out on this monstrosity. Or better yet, do a complete rollback. Google Reader gave me this error this morning. Looks like Yahoo TV upgraded overnight. Guess I will get my TV schedule information from other sources now. DHTML/AJAX Schedule is slow and confusing. Front page looks like a Flash designer got lucky — Look at all the dancing images! Complex, complicated, and visually disturbing. Oh, and no option to downgrade to the original, functional version. All I want is the TV listings. I wrote this in December 2004. A lot of things have changed since then. And a lot has remained immobile. I don’t know whether to add creative burnout to the raging fire I now know is Bipolar, or to see it as a part of a more general work-related malaise. I need to talk to a few more people to get a sense of where the work environment is going, what goals I could set for myself. What people expect of me, as compared to what I expect of myself. We have a strong feeling where the landing points for the family will be within 12-18 months. We have set three possible targets, and each has it’s positives and negatives. We aren’t making a final decision yet, as we want to see how the winds blow. All we have is 75-80 years. Sometimes it moves too slowly. 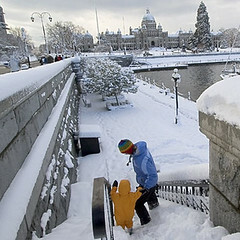 A photo of the Causeway (in front of the Empress Hotel) in Victoria, BC after the Sunday/Monday snowstorm. Snow in Victoria is pretty rare. Snow that sticks is even more rare. I’m addicted. I will pay whatever they want me to so I can keep calling US phone numbers from one application. And I can’t figure out why more people in the US and Canada still don’t use Skype. Maybe they think that it’s too good to be true. It’s very good, and it’s true. Up here in Maine, wineries are done the old-fashioned way. Back-breaking physical labour. Check out these photos of construction on the winery part of the winery (here). However, the nicely framed and hospitable winery space has another side: The old barn with the trench down the middle. Well, yesterday it had a trench. After two days of rock-hurling and dirt-flinging (mainly by Samantha and a small amount by me), the three-foot wide and two-foot deep trench running to the formerly askew septic tank is mostly filled in. It had to be done by hand in order to protect the PVC waste pipe from damage. That said, the work that Keith and Constance have done up here staggers my mind. They have done more work in a year than I have done in all my life. Hard, brutal work. While Constance holds a full-time job, and they manage a flock of sheep and three kids. Next fall, you should be able to sample their winery and distillery products. And (shameless plug) if you want to invest in a winery, or need winemaking/distilling consulting, let them know; e-mail and snail mail address on their web-site. So, how did you spend your Thanksgiving Day? Keith is installing the run-off / septic tank for the Winery. Last week, in the heavy rains, the hole it was in filled with water and the tank was bobbing up and down in a pit of muck. Now that the muck has been drained, he needed to make the tank level and fill around it. Keith did most of the work, but we had to jam rocks under it, and then lever it until it was level. Then Keith dumped fill in around the tank. Hopefully it will be stable. Now, it looks like we will get a blast of frozen rain. Oh, the joys of farm life. And not a Starbucks in sight. So, we’re packing up the minivan and heading for the idyllic wilds of Maine for the Holiday weekend. I will have connectivity, but frankly, there will be too much going on with five kids, four adults, a dog, and a flock of sheep (no sheep-human interaction! You people are sick!) to be online much. Skype, Skype, Skype, Skype…OH! Wonderful Skype! Over the next 12-18 months, my plan is to move to working from home more. Like, 100% of the time, when I’m not travelling. To help accomplish this, and to free myself from the servitude to the Telcos, I have started to migrate almost exclusively to Skype for my work communication. If I am online, I will likely be willing to chat; if not, you’ll bounce to my Skype voicemail.